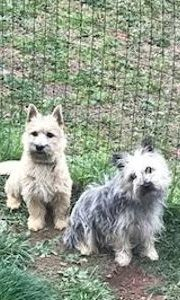 What began as a love affair with one little puppy turned into a passion for the Cairn breed for me.I bred Cairns for almost 18 years in the Adirondack Mountains of Upstate New York, and then moved to Virginia. I had my sixth child in 2016 and I took two years off while I have imported or searched for some of the most amazing breeding stock! I now have top notch studs from England and North Carolina. I have females left over from my New York lines and am so excited to offer Champion lines of Cairns.I tolerate zero inbreeding!! It affects temperament and is unacceptable. I choose breeding stock from Champion lines not for the bragging rights, but because it assures that my puppies are in line with breed standard. My babies are all raised in my home with my children, other Cairns(of course! ), cats, and our token hound dog. They leave here at 10 weeks well socialized by all!! I also make sure they have had nails clipped often, first shots and wormings, and, because I have a background in training, some basic beginnings in submission and obedience. I love my dogs, and it shows in my puppies. All of my dogs live with me and are trained and housebroken. They are well loved and, if it is best for them to be re-homed when they are done breeding they offer anyone a wonderful companion.